WELCOME TO PARADISE!!!! New for 2019: Brand new kitchen with new stainless steel appliances. All new flooring throughout, entire unit freshly painted. 55 inch Smart TV in Living room. 2 BEDROOM CONDO WITH POOL AND WIRELESS INTERNET. 1 1/2 BLOCKS FROM THE BEACH. CLOSE TO 2 RIDE PIERS. 1 BLOCK FROM WATER PARK. CLOSE TO GREAT SHOPPING DISTRICT. WALKING DISTANCE TO EVERYTHING. MASTER BEDROOM HAS QUEEN BED, FLAT SCREEN TV AND DVD PLAYER, SMALL BEDROOM HAS BUNK BED WITH FULL FUTON ON BOTTOM AND SINGLE ON TOP, FLAT SCREEN TV AND DVD/VCR COMBO. LIVING ROOM HAS A COMFORTABLE SOFA BED, 55 INCH SMART TV AND DVD PLAYER. KITCHEN HAS FOUR BURNER GLASS COOKTOP, MICROWAVE WITH CONVECTION OVEN, TOASTER, KEURIG COFFEE MAKER AND FULL SIZE REFRIGERATOR. THERE IS A TABLE AND 4 STOOLS FOR MEALS AS WELL AS A LARGE COUNTER TOP AND 2 STOOLS. THE BATHROOM IS SPACIOUS WITH GRANITE SINK TOP AND CERAMIC TILE FLOORS. We are all beach bums and love Ocean City New Jersey. My husband and I vactioned in Ocean City NJ every summer for the past 25 years. He has been vactioning in OC NJ with his family since he was a little boy. One year, our dream came true and we decided to purchase a property there. We immediately fell in love with The Legacy because everything is so close by. The shopping is great, and the locals are friendly. The town is clean and small. You can walk everywhere from our location. The beach is only 1 1/2 blocks away which is perfect when you have small children. It is so nice to be able to relax by the pool while the kids have fun swimming. Our condo is a small apartment that is a home away from home. Having a washer and dryer down the hall is very convenient. We are close to everything -rides, waterpark, great shopping. Even AC is only a 20 minute ride away. Our unit has Flat Screen TVs and DVD players in every room. For the kitchen we provide a blender, a crock pot, a griddle pan, plenty of good pots and pans, plastic containers, a measuring cup, plastic bowls, utensils for seafood, wine glasses, dishes, glasses, cups and coffee mugs. Iron and ironing board is in the hall closet as well as a small cooler. There are plenty of DVDs for the family and VHS tapes for small children. A nice clean quilt is provided for each bed along with plenty of comfortable pillows. There are are magazines in the magazine rack, and a couple of books in the master bedroom. There is a portable radio/CD player in the small bedroom. Loved the location, pool, ease if rental and the wonderful owners. Great place in a great town. Thank you very much for staying with us! We are glad that you enjoyed the convenient location and the pool. OC NJ is a great famlily resort town. We had a wonderful time! The place was clean and neat! It was a perfect place to stay, it had everything we needed. Christine was great, she was very attentive and answered all our questions promptly! Thank you. We can’t wait to have you again! Stayed here 7/7-7/14/18 have stayed at the Legacy property before but never is this unit. Very nicely beach decorated and really felt like you were down at the beach. Very clean and well maintained unit. The pool has always been a bonus at this property. Everything you could need was there and the owner was very easy to communicate with from booking straight through the end of our trip. Really looking forward to renting this condo again next year. I expected more from this property for what they charged. The main reasons I chose it were because it could sleep all my guests, had a pool, and was close to the beach/boardwalk for my little one. The location is nice - 1.5 blocks to the boardwalk and the (crowded) Plymouth Place beach. Easily walkable to the rides. The 2nd bedroom is really very tiny with no closet. In fact, there was very little closet/cabinet space available at all throughout the unit. The owners have stored their stuff almost everywhere, including the bottom of the only bedroom closet (so nowhere to stash away luggage, etc). Also, despite having almost all the kitchen cabinets full, there were only 4 dining bowls total. No oven or dishwasher and the previous renters left the dishes very poorly washed- I opted to buy disposable dishes instead of washing everything twice. The pool is unheated, so if you vacation during a cooler week like us (it was mid 70s to low 80s the week we were there), it is too cold to use. Also, I wanted a pool for my 3 year old- but this pool has a very odd 12" wall all the way around it, meaning you could ONLY access from the small stairs and there is no way to lift a child or climb in/out anywhere else. Would absolutely not recommend for children- they can't even hang onto the sides. We never used it at all. The biggest problem in the unit was that the fridge made a very loud, very annoying grinding noise frequently. I contacted the owners about this right away because my guest couldn't sleep well on the sofa bed due to this. I was told the fridge was "always noisy" and that it wasn't a big deal and didn't bother them. They declined to send anyone out to look at it. My guests were unable to get a good nights rest and I felt a bit cheated that I had spent a significant amount of $$ for enough beds to sleep my guests, and they couldn't even sleep through the night. It was only the week after I left when the owners visited the unit that they texted me an apology and said there was clearly something wrong with the fridge. I appreciate that, but it's a case of too little too late- the damage to my and my guests vacation was unfortunately already done. $100 of compensation was offered for the inconvenience , which I don't feel is quite sufficient, considering the amount I paid for the full week and that it really impacted our enjoyment of our vacation. I'd like to respond to each comment individually. 1) "Owners stored their stuff everywhere"
We leave a crock pot, blender, extra pillows and blankets as well as games for the kids to play in the master bedroom closet for our tenants to use. These items are not "our stuff," they are for the tenants use. We charge much less than most other units in the Legacy because the kitchen has not been updated. Oven and dishwasher are not listed among the things we have in the unit. 3) "The pool is unheated"
We have never had any tenants complain that the pool isn't heated. I'll mention it in our next condo meeting. 4) "The loud noise coming from the refrigerator"
It was a huge mistake on my part to assume that the noise was the usual refrigerator running noise that we always heard. I wish we would have discussed this issue over the phone instead of texting about it. Communicating via text messaging instead of in person or via phone causes problems. Issues just don't get communicated as clearly as they should via text message. I felt horrible about the noise and my lack of response to it. I offered to refund you $100 before I heard the noise myself. I would have given you more money back if you would have let me know how unhappy you were. The money was not an issue. I want my tenants to feel at home and to be happy. We plan to update our kitchen and add a dishwasher and an under the counter oven. Once we do this, we will raise the rent to match what our neighbors are charging. Very Nice accommodations, family had a great time. Very nice accommodations. Comfortable, very close to the boardwalk and all the attractions. I would highly recommend and would stay again. Thank you verymuch for staying with us. Please come again. We thoroughly enjoyed our stay at the The Legacy condominium that is offered by Chris and Scott. The condo is very clean and decorated thoughtfully throughout with a local beach theme. The condo is so close/convenient to everything and our car barely moved. It's a short stroll to the beach, boardwalk, local restaurants, and the Hobby Horse Ice Cream Parlor is a short stroll right around the corner which was a bonus for us. The owners really though about everything for their guests and it literally felt like a home away from home. The DVD collection was perfect for our little 3 year old for a few rainy days we experienced as well as the games provided. Another added bonus was the pool that we definitely took advantage of during our stay. 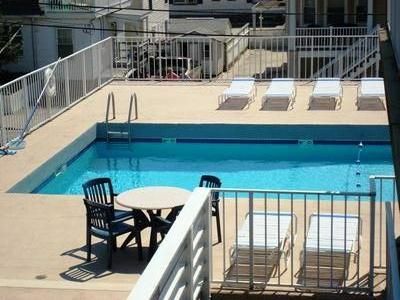 If you enjoy being in the heart of the action within Ocean City, NJ, then this is the perfect place for you. We look forward to staying here again if it is available. Thank you very much Brian. We are happy to hear that you enjoyed your stay. We would love to have you and your family back again. Park your car and walk everywhere! We are in a prime location close to everything! Ocean City Beach is considered by many to be one of the cleanest beaches in New Jersey and is only 1 and 1/2 blocks away. The beach stretches 8 miles across the shore line. 2.5 miles of the beach run against the boardwalk so that you have access to all of its amenities and clean public restrooms. Playland's Castaway Cove is only 1/2 mile away at 1020 Boardwalk. The park has rides for both little ones and older children. It also has a 19-hole, pirate-themed miniature golf course and arcade. Gillian's Wonderland Pier is only a 5 minute walk away. Located on 6th and the Boadwalk Gillian's has 31 rides to please both big and small children. Just look for the Giant Ferris Wheel. Right down the street from our condo at Plymouth and the Boardwalk is Boardwalk Adventures Waterpark. This Waterpark contains Lil Bucs Bay for smaller children and lots of tubes and slides and a lazy river for older children and adults. They even offer cabana rentals for people who just want to chill out, relax and enjoy the vacation. Only 2 blocks behind our condo is Downtown Ocean City on Asbury Avenue. It has over 100 unique shops and restaurants where you can find anything from trendy clothing to unique knick knacks and gifts to beautiful furniture and wonderful baked goods. I love to look around in Hoy's 5 and 10 and then hit Wards Bakery right next door for the best coconut donuts around! In the event of a cancellation, the owner will reimburse the tenant if they are able to rent the unit for the full amount. As a result, the earlier you notify the owner of the cancellation, the better chance that they have to rent the unit to another tenant. If the owners is unable to rent the unit at the full amount, they will keep all or part of the money received.